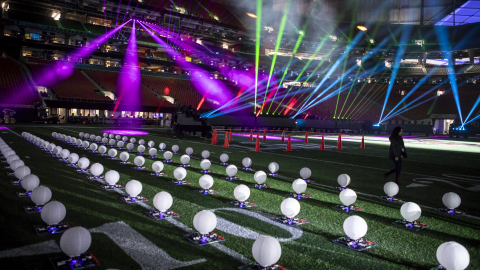 ATLANTA--(BUSINESS WIRE)-- Today during the Super Bowl, Intel Corporation partnered with the NFL* to create the first-ever live drone light show during a Super Bowl Halftime Show. Intel and the NFL will also make advanced Intel® True View™ highlights available for fans to relive the most exciting moments of the biggest game of the year. As Maroon 5 began the song “She Will Be Loved,” 150enhanced Intel Shooting Star drones floated up and over the field in a choreographed performance to the music to form the words “ONE” and “LOVE.” Intel enhanced the Intel Shooting Star drones specifically for the Pepsi Super Bowl Halftime Show to emulate the experience of floating lanterns. The drones were also enabled to successfully fly a pre-programmed path inside a closed stadium environment without GPS. Additionally, the 150 drones flown indoors exceed the world record that Intel earned flying 110 indoor drones at CES in 2018. Drone light shows and Intel True View are part of Intel’s larger effort to deliver powerful, innovative technologies that enable the rich viewing and entertainment experiences of the future. For more information on Intel’s drone light show, visit Intel's drone page. For more information on Intel True View, visit Intel's True View page.